The 8 panels in St johns Hall. 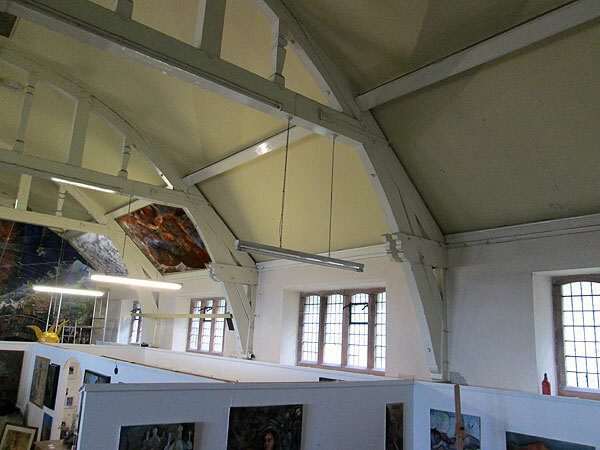 Work has been begun on the painting of the 8 flat ceiling panels in the old hall. There are technical difficulties in making 12′ x 6′ panels that hang facing downwards, or at a steep angle. I can’t paint these as canvases on normal strechers, they would sag. The canvas has to be stuck onto a board, and fastened somehow into place. Therefore I have begun the process in making the three 4′ x 6′ panels that make up a single 12′ length. Here is a photograph of the three panels side by side on the floor of the studio. 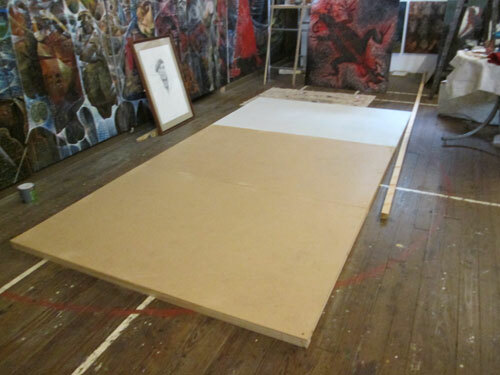 The three framed MDF boards side by side will make a single 12′ x 6′ panel to go into one bay. Here is an image of where it will eventually go. I have used computer trickery to add a drawing of one of the mythic dreamers who will fit into the bay, although the order is not yet decided. 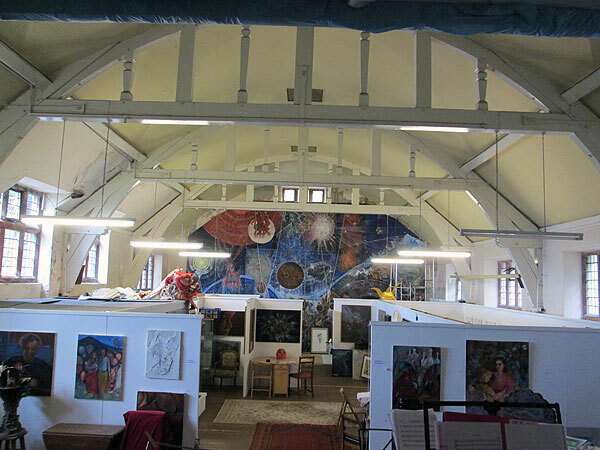 There are eight of these great spaces in the hall, well above eye level, so that the art work in the galleries will not be affected. You can just about see the eight spaces in this picture. I have described the basic idea of the mythic dreamer in a previous post, but the overall concept is to use these pictures to explore the diversity of myth and symbolism among the large branches of homosapiens. 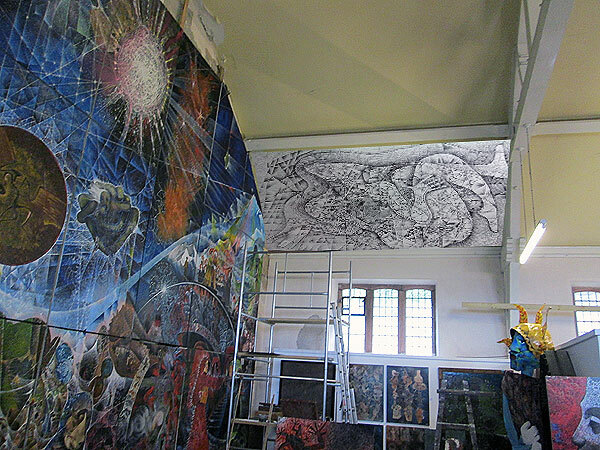 In this way the ideas of these panels links to the work of the large painting ‘captives of the cosmic web’. I intend to use a single large canvas to cover these boards, but the problem us compounded by my wish to approach the painting as a monoprint which will be turned over to be painted. More on that later.